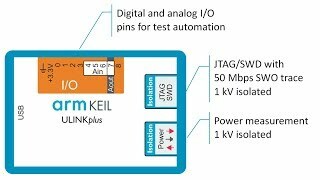 ULINKplus is easy to use and connects to Arm Cortex-based devices. It supports all classic debug features such as simple and complex breakpoints, SWV trace, and even multi-core debugging. Together with Arm Keil MDK, you can use Event Recorder and Event Statistics to profile your application for timing and energy consumption. The System Analyzer shows the correlation of software execution with power consumption and helps you to optimize the energy profile of your embedded system. Learn how we used ULINKplus to analyze a battery-powered Bluetooth Low Energy (BLE) beacon and to optimize hardware and software. The battery life improved from original 358 days to 863 days. 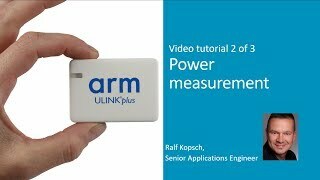 ULINKplus provides isolated JTAG/serial-wire and isolated power measurement connections to the target hardware. 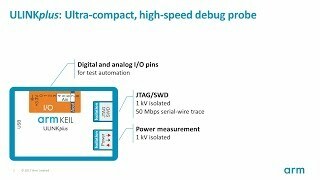 This is essential for testing applications such as motor control, power converters, or systems with sensitive analog processing. The power measurement is synchronized to event tracing which makes it easy to optimize the energy efficiency of a system. The intuitive graphical user interface allows you to quickly spot and attribute any unintended behavior to the right piece of code. For more information, watch our introduction videos available on the Quick Start page. The Event Statistics feature in the Event Recorder enables developers to easily collect and analyze statistical data when executing their application code. The available metrics cover execution time, counts, as well as energy consumption data collected with ULINKplus. 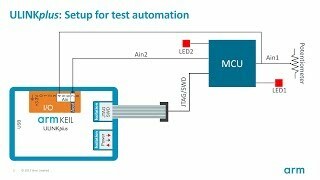 The integrated I/Os of ULINKplus are accessible from debug views or from debug scripts to interact with the target under test or to control automated test stands. You can easily configure the I/Os in the µVision debugger. Simply select the pin function (digital/analog and input/output). The values that are applied to the pins are automatically updated and displayed. includes a Configuration Wizard script to manually configure the IO pins. includes debug functions that create digital signals and analog voltage patterns. This table provides the basic technical specifications of ULINKplus. For more information, please refer to the ULINKplus User's Guide.